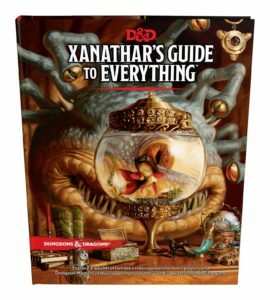 Much like Volo’s Guide to Monsters, the upcoming Xanathar’s Guide to Everything is a book intended for GM’s and player’s alike. I’m not sure if all of the “Guides” we’ll see for 5th edition will follow this tradition, but I won’t complain if that’s the case. Volo’s guide was by far my favorite book I’ve seen so far in 5e, but I’ve gotta say that Xanathar’s is quickly filling the #2 slot. The book is divided up into 2 major parts really, the first half being a player resource and the second half for DMs. Let’s dive in and talk about both. Bardic colleges: Glamour, Swords, Whispers. 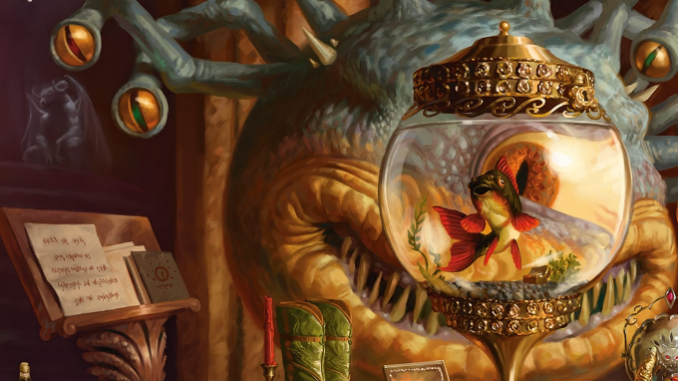 The player options in Xanathar’s guide take up the first entire half of the book, there are some great offerings for each class, although some definitely feel stronger than others. I don’t mean strong in a mechanical sense, but strong in a sense of what works for the archetype and what feels a bit off-center. Each class gets a few entries that provide some tables and other background ideas, origins, or motivations to inspire and add to the depth of your character. All of the tables are fun, but not all of the entries in each one are strong, and there are a few tables that I feel really missed the mark. For example, the Bardic “embarrassments” table is pretty great, helping you define a moment in your bard-career when things didn’t go over so well but served as a milestone in your development. This is a really fun table with some great roleplaying and narrative opportunities, where as the “Supernatural Mark” table doesn’t really inspire much Supernatural-ness for sorcerers. I feel like it should just be labeled “Birth Defects & Odd Mannerisms“. 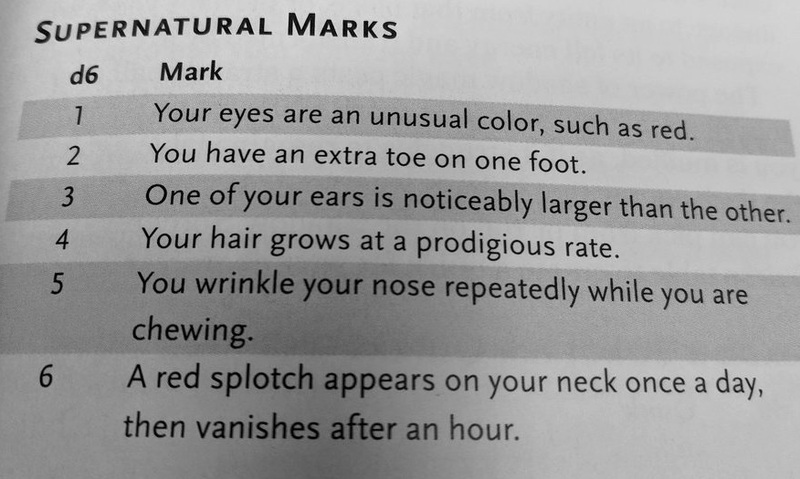 Some of these tables could really be spiced up pretty easily, as the above example: extra appendages and rapid hair growth are pretty boring, a red splotch that moves about? Not even like a cool glowing scar or birthmark? C’mon WotC, you can do better! The cleric tables are really juicy and even the other sorcerer tables are really evocative, then you get duds like this one. Beyond a few bad tables mixed in with the rest being otherwise stellar there are a few character options in this book that I feel were a bit weak. The Cavalier archetype for fighter’s seems very niche, and I don’t feel barbarians really need storm magic, nor do I feel that warlocks need the capability to make pacts with celestials. I understand that options are never a bad thing, having another melee/magic hybrid with storm barbarians, hexblade warlocks, and arcane archer fighters is pretty great. The whole celestial warlock thing doesn’t thematically make sense though. Warning, strong warlock opinions ahead: if you’re not making a deal with a questionable being in exchange for power it feels a bit off brand. The whole ethos of warlocks and pacts are that they are agreements entered into with some regard of weighing pros and cons, making a deal with a good creature seems odd. Why wouldn’t it just willfully grant powers to those willing to go out and do its bidding? I digress though, about 85% of the class options presented in here are really appealing to me, and I’m a hard person to please when it comes to this type of stuff. I’m especially fond of the Warlock Hexblade, and the Rogue Mastermind. I’d list the whole ToC but to show each class option, but Reddit’s already got that covered. The final section in the player portion of the book is dedicated to a slew of ideas (not rules) for your character. Any person who is into random tables and/or feeling uninspired, or for those players who are shy or just lack imagination – this section is solid gold. You can craft a whole origin story and background here: parents (of every racial variety), birthplace, siblings, family, family lifestyle, childhood home, childhood memories. The list goes on to extrapolate on personal decisions and life choices based on your character’s background, there’s a d6 table for each background and how they came into it. The same types of tables also exist for each class as well. There’s also a multitude of “life events” tables where you roll on one table, to see which other sub-table you roll on ala Demon Lord. Those tables are as follows: Adventures, Arcane Matters, Boons, Crime, Punishment, Supernatural Events, Tragedies, War, and Weird Suff. Unfortunately the “weird stuff” table isn’t really all that weird and I feel like it was just the leftovers that didn’t necessarily fit in one of the aforementioned categories. This section wraps up with a short section full of racial feats, a nice touch and really cool if you’re into feats for 5e. Most are good but some of them feel like a weak choice when considering you’d be forgoing stat bonus increases since they apply to such niche situations. Again though, more options are never a bad thing and some of these are so juicy when it comes to narrative / thematic elements that I can see players having a hard time weighing their options. A lot of them offer +1 to a stat along with a trait, which is a nice trade off for both stat increases. 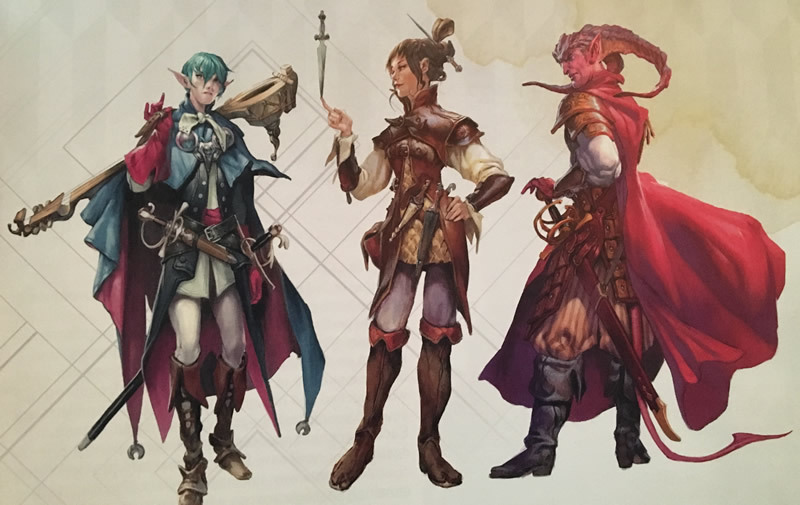 There are a ton of options for DM’s in the book, beginning with some specific rules on falling from very high elevations, sleeping in armor, waking characters up, going without rest, and tying knots. Yes, some of that all sounds very random, welcome to Dungeons & Dragons. Beyond that there’s 6 sizeable sections on the following: tool proficiencies, spellcasting, building encounters, traps, downtime, and awarding magic items. The tool proficiency section is really there to make them more appealing and flesh them out. Have you ever wondered how you can really put Cobbler’s tools to use? Well now you’ll know that not only can you repair shoes, but you can maintain them, craft hidden compartments in them, and also know all that went into their crafting and their history. It outlines every tool kit in the PHB and explains how to use them in conjunction with skills, making these a much more attractive option for players now. The magic items outlined in the book are pretty neat, if only 4 pages worth. Unfortunately rules on giving out treasure simultaneously trigger me and put me to sleep so I can’t give you honest feedback on that section of the book because I skipped those 2 pages. Let’s get into the other more interesting stuff now. This section goes over the minutia of things such as identifying spells, and perceiving spellcasters actions as they cast when the spell has a less obvious (or no) perceivable effects, which is nice. It also goes over what happens when a spell has an invalid target (pro tip: it doesn’t work), I’m not sure why people need things like this explicitly explained to them but I’m sure it’s helping someone somewhere. This section also goes on to very intricately detailing how various spell effect areas look on a gridded map, I think it’s a requirement for every edition of D&D to eventually have at least a dozen pages / pieces of art showing explanations of what cones and spheres look like when converted into squares. Luckily, the spell material outlined in Xanathar’s isn’t all obvious advice and pictures of shapes, as the 3rd full chapter contains 25 glorious pages with tons of new spells for 5e. Some greats return as well, my personal favorite: Chaos Bolt. A few other highlights include: Aganazzar’s Scorcher, Danse Macabre, Druid Grove, Infernal Calling, Melf’s Minute Meteors, Snilloc’s Snowball Swarm, Soul Cage, and Tenser’s Transformation. Encounter Building. There’s an entirely revamped (“alternate”) section on building encounters for your players here, and it is detailed. I put “alternate” in quotes because really, while this is presented as an option, it’s obviously a superior method than the ones outlined in the DMG. The underlying math is the same, but the adjustments allot for a more flexible method that gives the GM a better idea on just how lethal things will be. It also adds some guidelines for adding flavor to encounters via random tables such as monster’s relationships with one another and their personality, there’s not much there but it’s still a nice aide. There’s a quick matchup table that outlines a less precise, yet much faster method if you’re pressed for time too. Lastly, there’s a pleothra of random encounter tables for every tier of play and every climate and geographic region imagineable (including the Underdark, and Urban environments). Traps. The trap guidelines here break down traps into two categories: simple and complex, as opposed to magical and mechanical as presented in the DMG. The guidelines here are pretty well done and allow for a more malleable view of traps, and also giving some good guidelines for save DCs, damage, and spell equivalent by level. The complex traps really shine here with traps that have ongoing effects and increase in strength each round, and explicitly states that disarming a complex trap should require the character to be exposed to the trap’s effects. Unfortunately they only outline 2 examples of complex traps, but there’s easily enough there to get your mind going to make your own. Downtime. Another idea further extrapolated on than previous books, the downtime guidelines are here and very thorough. Downtime is explained as being a way for GM’s to run campaigns that take place over longer periods of time, or for a way for characters to spend their money. Conversely, in my opinion downtime provides great filler content for in-between sessions that get played out via email, IM, message board or whatever means of communication you use to keep players engaged between sessions. There is a slew of downtime activities full of tables of various outcomes for each activity including having a rival, shopping, carousing (low class, middle class, and upper class! ), crafting items and the complications, crime, gambling, pit fighting, religious service, research, scribing scrolls, and training languages or proficiencies with tools. Odds & Ends. The book also dedicates a few pages to things like how to run a shared campaign, along with a code of conduct for DM’s to not be dicks to each other during that collaborative creative process. Also, designing adventures, building encounters, and generating characters within a shared world. There’s also a “checkpoint” system for advancement instead of XP or Milestones, which is a nice median between the two options. Lastly, about 17 pages dedicated to names both male and female, of every race and ancestry for humans. Seems like filler to some, but is pretty great for me as I get hung up on names pretty often and find online generators to be bad more often than not. Overall I believe Xanathar’s Guide to be a great book for DMs and players alike. It acts as a nice addition of options that can improve your game, or at least give it some more life and more options. I’m looking forward to whatever comes next! Until next time, game excellently with one another. Regarding the celestial warlock, I think it can work as long as the DM makes it equally problematic for the character as they would for an Archfey or Fiend. The key point is that Celestial patrons are not Gods. They’re merely the celestial servants of Gods. Therefore if the DM runs the Good warlock patron the same way they handle a cleric’s God, they’re doing it wrong. Regardless of whether a warlock pact is made with an Evil or Good patron, the warlock is trading away the freedom to make their own decisions and run their life as they see fit. A cleric or paladin’s God tends to be a fairly passive entity, happy to let the character get on with it as long as they adhere to the appropriate tenets and take part in the right causes. A Solar or Ki-Rin is a lesser creature with far fewer concerns. Their attention is not divided among thousands or millions of followers and also they aren’t involved in the complexities of divine politics. They have a handful (or maybe even just one) warlock agent, and can therefore take the time to take a personal interest in exactly what the Celestial warlock is doing. Their oversight could make the warlock feel just as trapped and helpless as if they were under the cloven hoof of an Archduke of Hell. 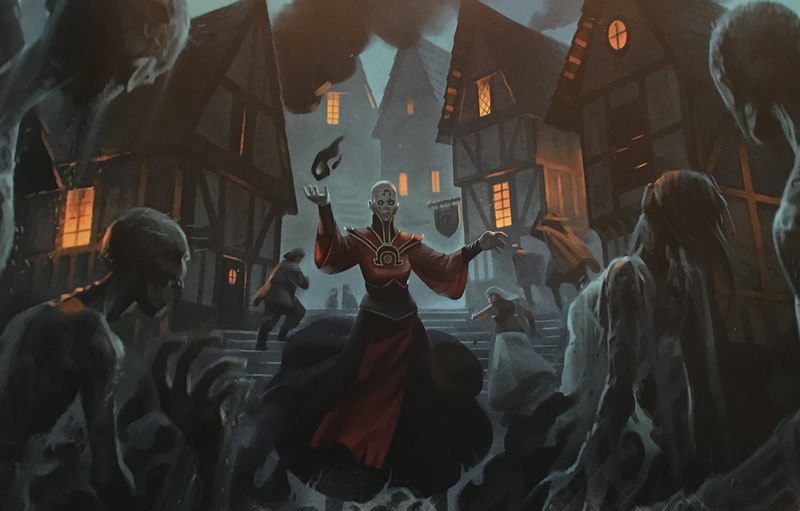 Just because the creature is Good doesn’t mean it can’t make demands of the warlock, and a perfect paragon of Good and Law (or Good and Chaos) can be just as unfeeling towards the character’s own wants, desires, and needs. When the Celestial patron’s eye is upon the warlock, they can’t afford to make a single misstep. They must adhere to any law, give away their last morsel of food to the hungry, etc. A Paladin or Cleric might do those things because they know it is right, and if they fail to do so (particularly regularly) they might lose their connection to their God. But the Celestial warlock is watched and judged constantly. If they fail to act according to the extreme nature of the patron’s alignment, they will be punished. Repeated failure results in their soul being claimed, perhaps to increase the patron’s own power, perhaps to gift the power to another more worthy agent, perhaps to create a new, untainted life somewhere. Nice! Here I was only coming buy to make a joke about “off-brand” warlocks and you’ve made a compelling argument and understandable scenario for them. A tip of my beanie to you! You and I have very different gods in our games. I don’t run with passive deities for clerics and paladins. I don’t think that’s a valid presumption of the nature of the relationship. An active god with set code of conduct is going to be pretty limiting…it’s a god, so, dividing its attention a million times over isn’t a hard thing. But given that very fundamental difference of opinion, I’ll agree to disagree.